Hello Wyoming! A Tail of Trail Magic. 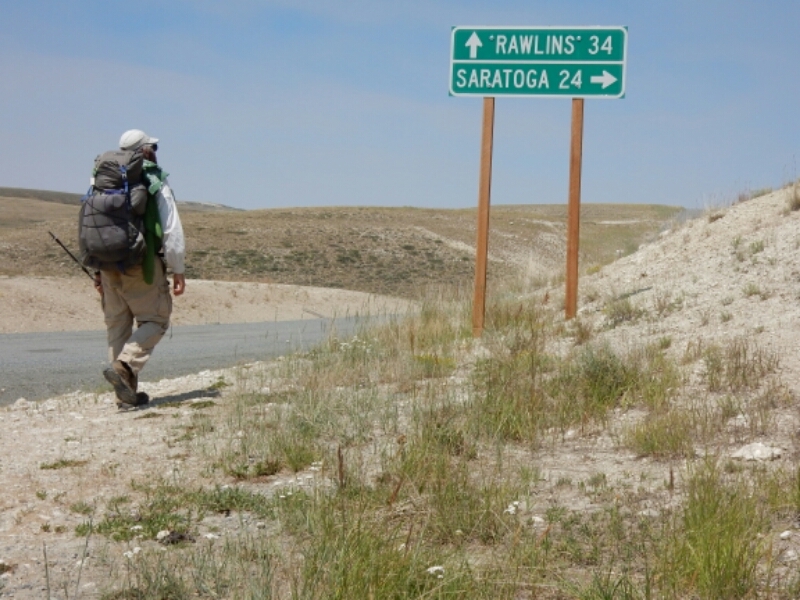 I really wanted reach the next trail town, Rawlins, Wyoming, with as much road walking as possible. But my maps of the official CDT route did not seem to have as many miles on roads as I expected after reading various accounts on Facebook from hikers in front of me, including Allgood, the founding member of the Portland Mafia group I embarked with on April 18. A couple of hours after crossing into Wyoming I encountered Mammoth, the second southbound thru-hiker I met within a one hour period. Wow, southbounders already! 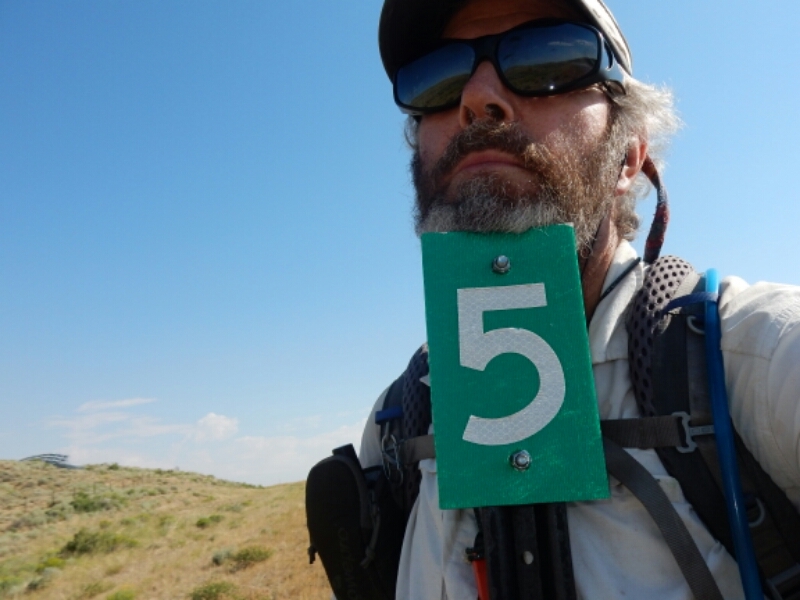 Mammoth and Phantom started at the Canadian border on June 1 and they reached the half-way point of the CDT already. But it was Mammoth’s description of the alternate route on a long stretch of road that easily, although in a dry and boring way, led to Rawlins. I wanted to take that route. 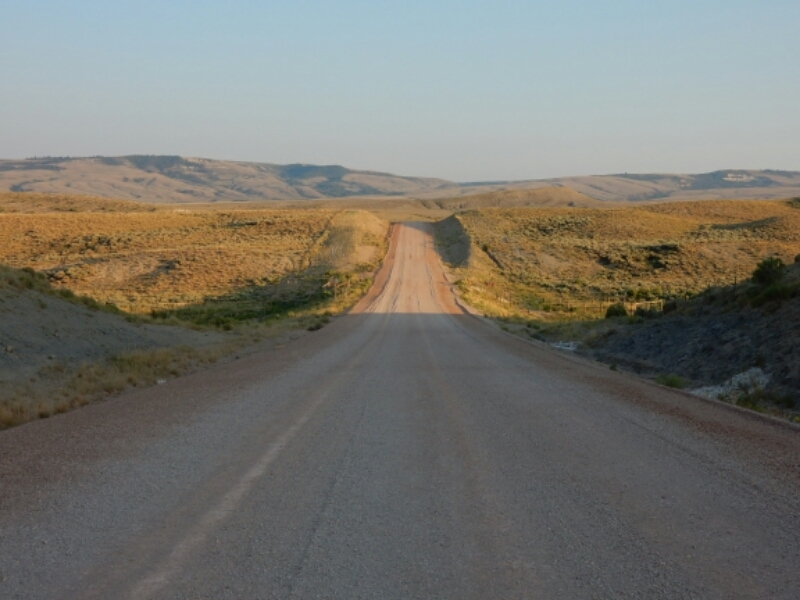 The next morning, on July 25, I decided to hitch a ride to the tiny town of Riverside, where I would be able to download the Jonathan Ley maps for Wyoming (showing the alternate road walk to Rawlins), rest my knee, and possibly get an appointment to see a doctor in Rawlins. All three goals were worth the time to divert off the CDT for a short time. The alternate along the road would save 15 miles from hiking the official CDT, and the flat road would most likely be friendly to my hurting knee. The second vehicle that drove up Battle Pass stopped, but what really surprised me was southbound thru-hiker, Billy, was in the pickup truck also heading to Riverside. Let the trail magic begin! Billy described the road walk in great detail because he had just hiked it. Better yet, he had the hard-copies of the maps and offered to give them to me. After all, he had no further use for them. Awesome. I made a great decision to deviate off the CDT and down to Riverside. Upon arrival to the general store in town I walked to the Lazy Acres Campground and Motel, where I found Dustbunny and 2014 thru-hiker Tickled Pink tossing a football! I was happy to see Dustbunny again and finally meet Tickled Pink, who had hosted Karate Kid, who I last saw on Parkview Mountain. TP is so generous and enthusiastic, and he agreed to drive me back to Battle Pass the next morning. Even more trail magic! While at the Lazy Acres I downloaded digital versions of the maps for Wyoming including the alternate road walk to Rawlins. And I topped off the magic with two great meals that involved a burger and fish & chips! To help keep the good karma coming around, a give Billy some tape that he needed to repair a jacket and other repairs that might be needed. Best wishes to Billy on his journey to the Mexico border. The 24 hours I spent getting to and staying in Riverside brought me some of the best trail magic! The road walk was awesome. It took the pressure off my knee for about 40 miles. When the well-graded gravel road turned to pavement, I enjoyed posing in front of the mileage markers in a fun way to count down the miles to Rawlins. 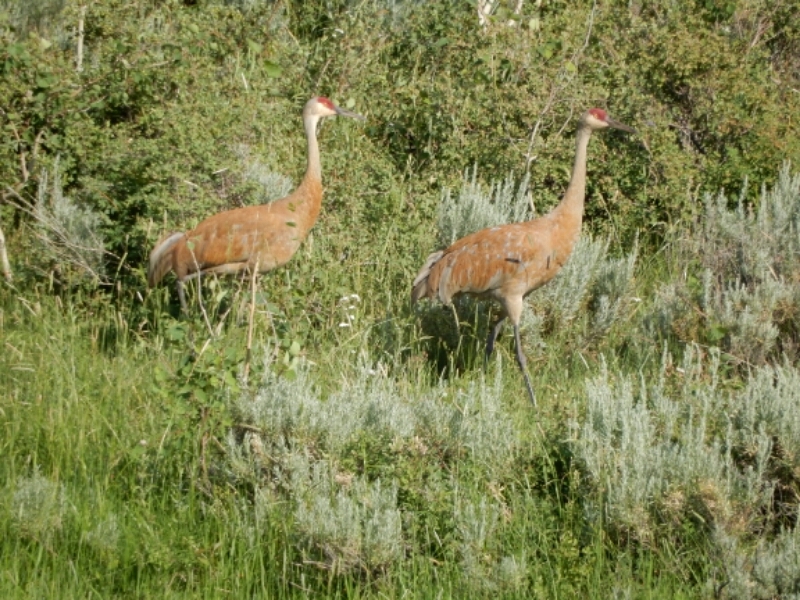 Along the way I spotted two beautiful cranes, antelope, and deer. Unfortunately, the doctor in Rawlins told me I likely have a torn lateral meniscus that would eventually need to be confirmed with an MRI (I declined) and possibly arthroscopic surgery when I return home to Portland. I received a more substantial knee support and, later, lots more aspirin. I won’t expand on my frustrations with hiking on a national scenic trail which forces hikers to share the trail with mechanized users. The injury originated near Breckenridge where I encountered over 100 mountain bikes and riders who ignored the common-sense protocol when coasting downhill and meeting hikers ascending uphill, I choose to move forward, and northbound. No worries. 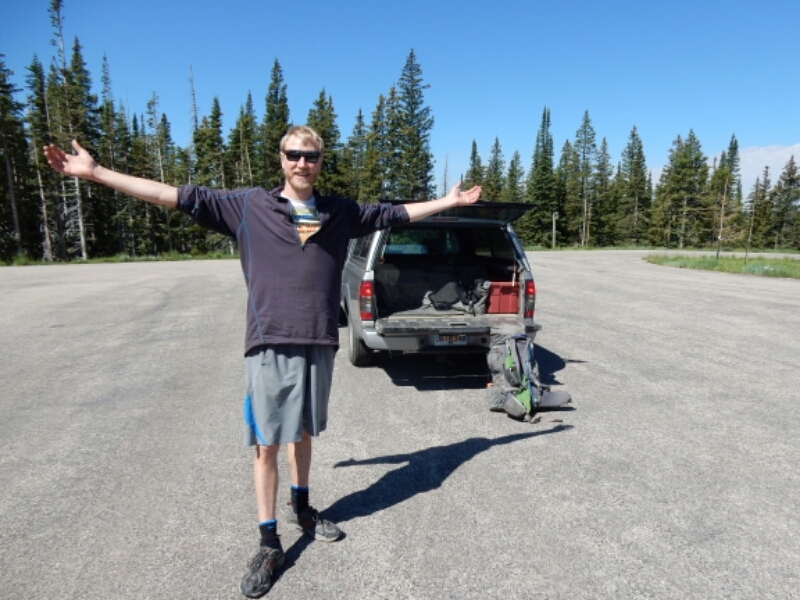 GREG IN WILD HIKES ON…TO CANADA! 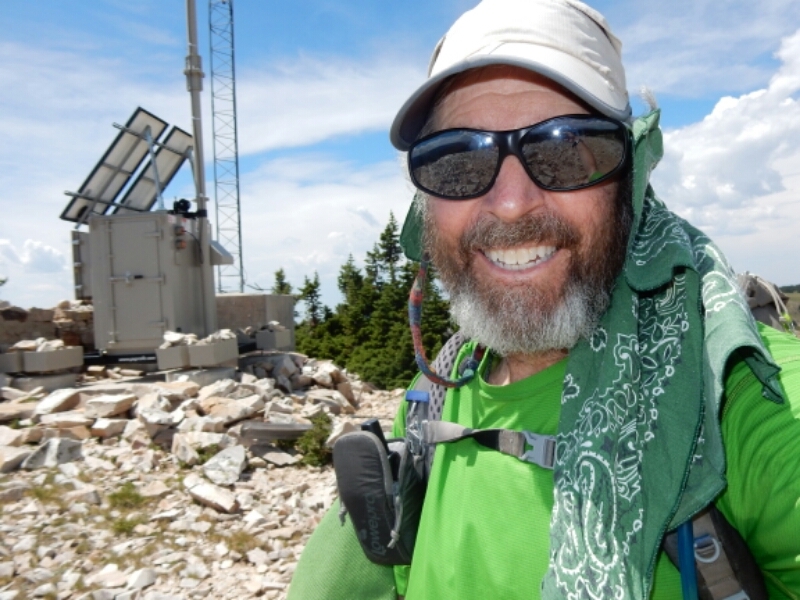 This entry was posted in CDT Wyoming, Continental Divide Trail 2016, Section 7: July 16-31 and tagged CDT, Greg In Wild, Roger Carpenter. Bookmark the permalink. Bummer about your knee! Hope it will be well enough to carry you onward! Your photos are so marvelous. They help me understand why someone would undertake such a journey. It is all pretty magical! I’m so happy to see the photo of you still smiling in spite of this set back. I have no doubt that with your determination, your new knee support, regular doses (but not over-doses!) of aspirin, and the well wishes of your many supporters, you will indeed HIKE ON…TO CANADA! XXOXOXO! Glad you’re out of Colorado on flatter ground. Hope that knee gets better. You’ll love the Wind Rivers. They’re gorgeous! Good Luck with the knee Roger. I tore my meniscus in 2015 and eventually had surgery. I can do everything I want again now, though the recovery was work. I still often have a sore knee though it doesn’t keep me out of any action. I did manage to hike with the damaged knee last year, but nothing like you are continuing on with. A fair warning, as I continued to use the damaged knee, it did get worse. My knee was locking up near the end prior to surgery. It prevented me from walking or doing much without significant pain. Glad you know what is wrong with your knee.